Vitamin C is an antioxidant you can get easily from a variety of foods or from supplements. Because vitamin C is water soluble, your body can’t store it, and you need the correct daily amount to prevent deficiency. For adults, the recommended daily vitamin C dosage depends on your gender, whether you’re pregnant or nursing, and whether you smoke. A higher dosage isn’t toxic but may result in gastrointestinal side effects. Your body needs vitamin C to form collagen, which makes up the connective tissues in the body and helps heal wounds. Vitamin C contributes to the overall health of your bones, cartilage and teeth. This nutrient plays a role, too, in your body’s absorption of nonheme iron, which comes from plant sources. When eating iron-rich foods like spinach, for example, it’s best to also eat some vitamin C-rich food, like tomatoes or berries. Because it’s an antioxidant, vitamin C supports your overall immune function. Antioxidants like vitamin C scavenge for free radicals — those wayward molecules that can cause DNA damage in the body and lead to chronic illness. The National Institutes of Health notes that those who regularly consume fruits and vegetables high in vitamin C enjoy greater natural protection against cancer and a reduced risk of heart disease. The recommended daily allowance for vitamin C — the intake sufficient for the nutrient needs of most adults 19 and older — is 75 milligrams for women and 90 milligrams for men. At 18 years of age, adults require less vitamin C — women need 65 milligrams, and men need 75 milligrams. Pregnant women over 19 require 85 milligrams daily, and those who are nursing need 120 milligrams. At age 18, women should get 80 milligrams of vitamin C when pregnant and 115 milligrams when nursing their babies. Deficiency of vitamin C, which presents in a condition called scurvy, is rare in developed countries but can occur in those with poor diets. Signs of deficiency can appear within a month of consistently low intake of this vitamin. Scurvy symptoms include fatigue, swelling of the gums and tooth loss. Smoking, in addition to its well-known connections to lung cancer and heart disease, depletes the body of vitamin C. Active smokers need at least 35 extra milligrams of vitamin C per day. Cigarette smoke produces free radicals in the body, which vitamin C works to neutralize. Other adults may need a higher vitamin C dosage, too. Those with substance-abuse issues and people with malabsorption conditions may be at risk for vitamin C deficiency. Ask your doctor if you’re getting enough vitamin C or if you need to boost your intake. The Linus Pauling Institute of Oregon State University undertook a review of studies and found that natural vitamin C from food and synthetic vitamin C in supplements demonstrate the same bioavailability; that is, the body absorbed both forms of the nutrient equally well. According to Harvard Health Publishing, though, it’s better to get vitamin C from foods than to follow a nutrient-poor diet and then take supplements to make up for vitamin shortfalls. Through a good, well-rounded diet, you get the benefits of other nutrients and phytochemicals working in conjunction with vitamin C.
Besides, as Harvard Health Publishing also notes, research on the benefits of multivitamins has had mixed findings, and, as a result, the U.S. Preventive Services Task Force does not recommend vitamin supplements to prevent disease. By including more fresh fruits and vegetables in your diet, you’ll get all the nutrients you need on a daily basis, which leads to overall good health and disease prevention. The Food and Nutrition Board sets the upper limit or UL for vitamin C — the most you should get in a day — at 2,000 milligrams. While it’s not toxic to ingest more than that amount, a higher vitamin C dosage may result in gastrointestinal issues, such as diarrhea, nausea and cramps, as well as headaches and insomnia. Your body may not even absorb the extra amount. The National Institutes of Health reports that the body absorbs less than 50 percent of a vitamin C dosage over 1,000 milligrams a day. What your body doesn’t need it excretes in urine, so you’re literally flushing away those excess milligrams — and the money you spent on supplements. In contrast, at a more modest vitamin C dosage of 180 milligrams or less, the body will absorb 70 to 90 percent, says the National Institutes of Health. In cold and flu season, you may start popping vitamin C pills in an attempt to ward off respiratory illness. It’s a common response, but does it really work? A summary of evidence from 45 studies, published by Medwave in 2018, concluded that vitamin C does not prevent the common cold. While it can’t prevent colds, however, the nutrient may help some people reduce their symptoms. A study published in the Journal of Health Care and Prevention in 2017 found that 480 milligrams of vitamin C taken with 800 milligrams of aspirin did reduce early symptoms of a cold compared to placebo. A meta-analysis of nine clinical trials, published in BioMed Research International in 2018, also found that a higher dosage of vitamin C, taken at the onset of a cold, helped reduce the duration of the illness and lessen its symptoms. The extra amount, though, only benefited people who had already been taking vitamin C supplements on a daily basis and got a cold anyway. The collagen that vitamin C helps to form is a major component of your tissues. Collagen in the skin tends to break down as you age, causing wrinkles and sagging. A study on middle-aged mice, published in Food Science and Biotechnology in 2018, found that oral vitamin C supplements helped stop wrinkles by increasing collagen fibers. The researchers concluded that vitamin C may be an effective preventive against aging skin. Aging can also make skin appear duller. 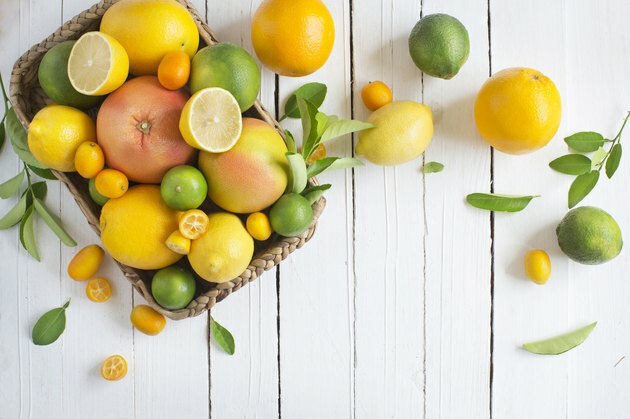 A human study, published in the Journal of Food and Nutrition Research in 2018, concluded that a mixture of citrus peel extract, vitamin C and l-cysteine, taken orally, brightened healthy women’s skin after four weeks and carried no side effects. In addition, the antioxidant powers of vitamin C help strengthen the epithelium — the thin outer tissue that protects the skin — against bacteria and environmental damage, according to an article in Nutrients in 2017. If you do decide to take vitamin C pills, be aware that there are many varieties and not all of them are created equal. The Linus Pauling Institute reviewed different types of vitamin C supplements, looking at ease of absorption, among other factors. The institute concluded that three different kinds of vitamin C pills — liquid, tablets and chewable tablets — all appear to have equally good absorption. However, studies present conflicting evidence on the efficacy of timed-release vitamin C.
What about the brands of vitamin C that tout their inclusion of bioflavonoids or rose hips? The Linus Pauling Institute could find only one small study in which vitamin C with bioflavonoids positively affected the nutrient’s absorption. Dr. Andrew Weil says that the inclusion of rose hips in vitamin C pills doesn’t add to the quality or efficacy of the supplement, just the price. Getting vitamin C from foods is easy, as long as you consume plenty of fruits and vegetables. ChooseMyPlate.gov, the U.S. government’s guide to healthy eating, recommends filling half of your plate at each meal with fruits and vegetables. Opt for whole fruits instead of juices and vary the kinds of fruits and veggies you select each day. You may automatically think of oranges and other citrus as the fruits highest in vitamin C, but in fact, guavas, kiwis and strawberries all contain more of the nutrient than oranges. Papaya offers just slightly less than an orange. Raspberries, blackberries and blueberries supply ample amounts of vitamin C, too. Among veggies, broccoli, cauliflower, Brussels sprouts and cabbage all contain more than 60 percent of the daily value for vitamin C, if you follow a 2,000-calorie diet. Tomatoes and bell peppers also supply an excellent amount, as do leafy greens such as kale, Swiss chard and spinach. Eat vitamin C-rich foods at every meal to get the milligrams you need daily and replenish your store of this nutrient. To kick off your day at breakfast, slice a half-cup of strawberries onto your morning oatmeal for nearly 49 milligrams of vitamin C. If you prefer to start the day with eggs and toast, include half of a medium-sized grapefruit as a side, which yields 44 milligrams of vitamin C. Try a half-cup of blackberries in your Greek yogurt for 30 milligrams of vitamin C, or a half-cup of pineapple chunks, which gives you about 40 milligrams. Load up on veggies with vitamin C from the salad bar at lunch. Start off with a base of leafy greens. One cup of baby kale delivers 19 milligrams of vitamin C, while the same amount of Swiss chard contains nearly 11 milligrams. Top your greens with cherry tomatoes, which provide 10 milligrams in a half-cup, and sweet bell peppers, offering a whopping 59 milligrams in a half-cup of slices. Get protein by adding baked chicken or broiled salmon to your vitamin C-rich salad. Add a small orange for an extra 51 milligrams of C.
By dinner, you’ve likely exceeded your vitamin C needs for the day. In case you skimped at your earlier meals, though, enjoy a side dish of a half-cup of steamed broccoli with a clove of garlic; the combo provides 42 milligrams of vitamin C. Or have a medium baked sweet potato, which offers 22 milligrams of the nutrient. Harvard Health Publishing: Harvard Medical School: Should You Get Your Nutrients From Food or From Supplements? Medwave: Does Vitamin C Prevent the Common Cold? Dr. Andrew Weil: A Preferred Source of Vitamin C?